Whitesheet is one of my favourite sites. 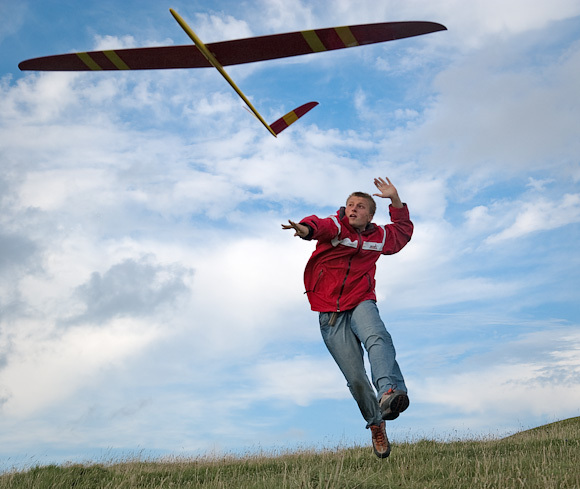 Not because it's the best slope (which it isn't), nor for the traffic queues which grace the A303, but because the flying there tends to be refreshingly technical: the wind can blow a gale, but try too hard and the model will reward you by falling off the corners. The fact that the car park is a few wing spans from the slope is just the icing on the cake. Several familiar names were missing, but twenty-six competitors turned up, an ideal entry for an F3F competition. John Bennett aka Blobby returned to the fray after a layoff, and was in good form for both the EPP 60 on the previous day as well as the F3F (we're working on him to return more regularly!). Despite a less than perfect forecast, we were blessed with sunshine and 10 - 20 mph winds for most of the day. Times improved steadily from the 50's to the low 40's, as the wind swung to pretty well square on the slope. Such are the demands of this bowl site, that there were several cuts as well as the odd prang. Phil Taylor had an adventure he wouldn't wish to repeat with his Ascot, and John Sage managed to finish off his already damaged Ceres fuselage. Even Graham Reed was spied walking back from the slope with a tuft of grass hanging on to his wing tip! On a happier note, CD Vic Eldrige wore a huge smile when he won an early round with his faithful Viking. With his second consecutive win, as well as a third place, Simon Thornton looks all set to take the BMFA league crown. My thanks to Vic Eldridge for his enthusiastic and effective CD'ing - we started at as near to 10 am as dammit, and in eight hours managed to whiz through nine rounds. Also to helpers Mark Redsell, Mike Evans, Graham Reed, and John Sage for helping out. A true collaborative effort!